Pahrump Bowling News: Jim Reynolds bowled an 835 series on Jan. 19. 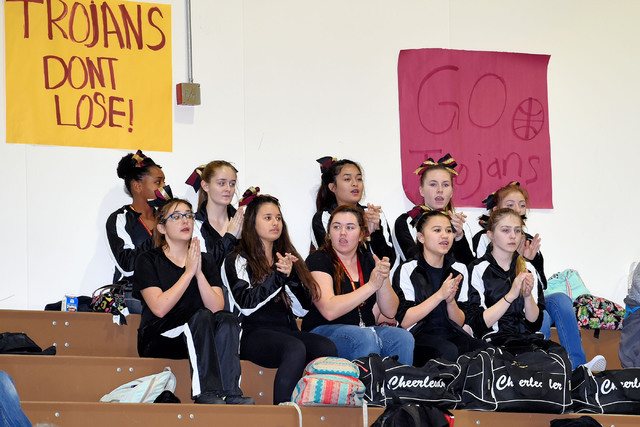 Peter Davis / Special to the Pahrump Valley Times Pahrump Valley High School cheerleaders at the Mojave wrestling dual. If you haven’t gone to a Trojans wrestling match, put it on your to-do list. The high school is one of the few schools that actually packs the gym and has its cheerleaders and band at the meets. 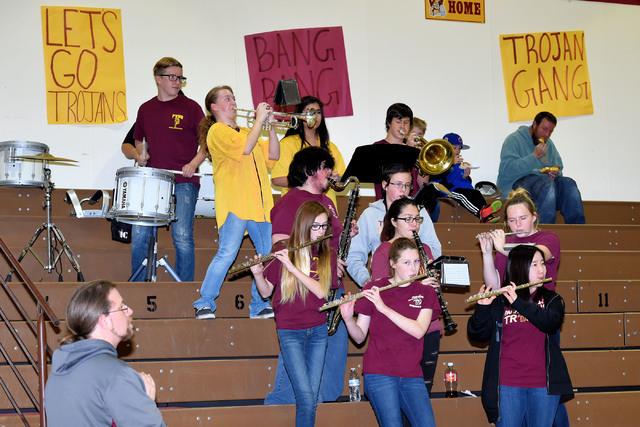 Peter Davis / Special to the Pahrump Valley Times The Trojans pep band plays at the Mojave wrestling meet, which was the last one of the season. Royals pitcher Yardano Ventura, dead at 25 on Sunday. He was killed in an auto accident in the Dominican Republic. He was the second young pitcher to die in the last four months, according to CNN. Brent Musburger said this week he is retiring from ESPN on Jan. 31, according to ESPN. Musburger will start up a new sports betting network called Vegas Sports Information Network, which is based out of the South Point Hotel and Casino in Las Vegas. On Tuesday, Big Ben Roethlisberger of the Pittsburgh Steelers said he might call it quits while being interviewed on a hometown radio station. The QB said he needed time to evaluate whether or not to come back next year. That’s the rumor this week. Who knows for sure. Oscar De La Hoya was arrested for suspicion of DUI on Tuesday by the California Highway Patrol, according to USA Today Sports. He is the CEO of Golden Boy Promotions and has a successful second career as a boxing promoter. And it’s final, it will be Williams vs. Williams at the final at the Australian Open. On Wednesday, tennis star Serena Williams beat Croatia’s Mirjana Lucic-Baroni and is one win away from a record 23rd Grand Slam title, with her sister Venus standing in her way, according to the Guardian.com. Usain Bolt was the only sprinter in history to win three gold medals at three consecutive Olympic Games. However, nearly nine years after the Beijing Olympics, he was stripped on Wednesday by the Olympic Committee of his 2008 relay gold medal after a Jamaican teammate was disqualified for doping offenses, according to USA Today. Don’t feel bad for him, he still has eight, with a possible eye on more in 2020. The Super Bowl: Super Bowl LI between the New England Patriots and the Atlanta Falcons will be played on Feb. 5 in Houston at 3:30 p.m.
Fox will televise the game. The game also will stream live on FoxSports.com. Westwood One will carry the radio broadcast.